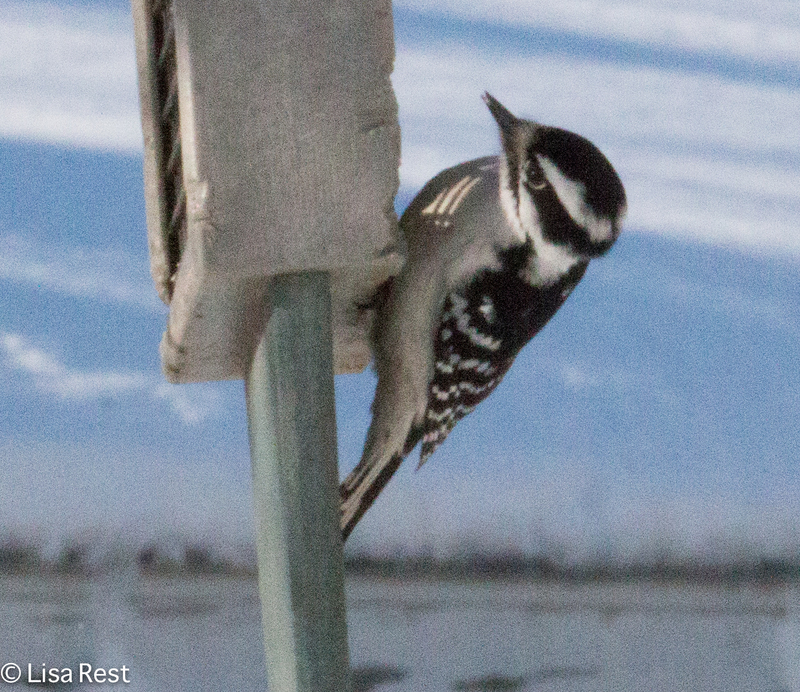 There’s perhaps more going on inside the house than outside it bird-wise, but the most captivating moments are often beyond my ability to capture because they involve me. Like yesterday when I was playing piano, one of the young Zebra Finch males landed on top of the music and sang his song to me that he’s been working on, over and over, reminding me that it will soon be time to get out the music paper and try to write down his and everyone else’s offerings. After a week of trying to keep the car movable around mounds of snow and driving it around the block at best, it was almost an exhilarating experience to drive this weekend, not that I went much farther than the dentist, the pool and grocery shopping yesterday, when there was sunshine, and then to the Chicago Portage today, when there was not. But dentist appointments are not scheduled around the weather, and actually the gorgeous sunshine might have explained the virtual emptiness of the pool, which meant I had an entire lane to myself to swim in for an hour, something that never happens on a weekend. 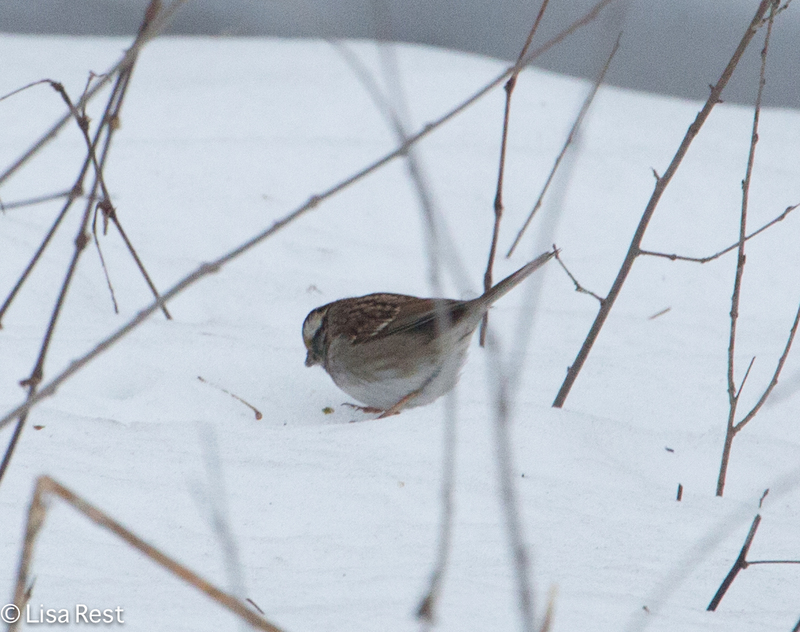 Anyway in spite of the cloud cover I decided to go out while we were still experiencing a partial thaw, and see what it was like shooting with the extender on the 100-400mm lens, with the Mark III 5D which I haven’t used for quite a while. It’s an experiment I will have to repeat several times before I decide exactly what to take with me on my upcoming trip, but I have to say I immediately loved the quietness of the shutter click on the Mark III, I had forgotten all about that and gotten used to the noisy report of the 70D. 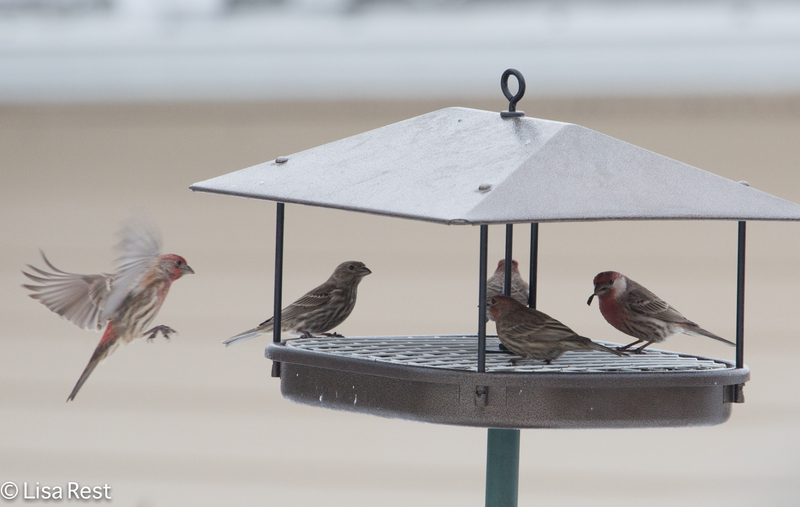 I have to say the birds never seem to mind the extra noise, I guess they assume we humans are too noisy anyway, but I like the quieter camera almost as much as I like my quieter car. 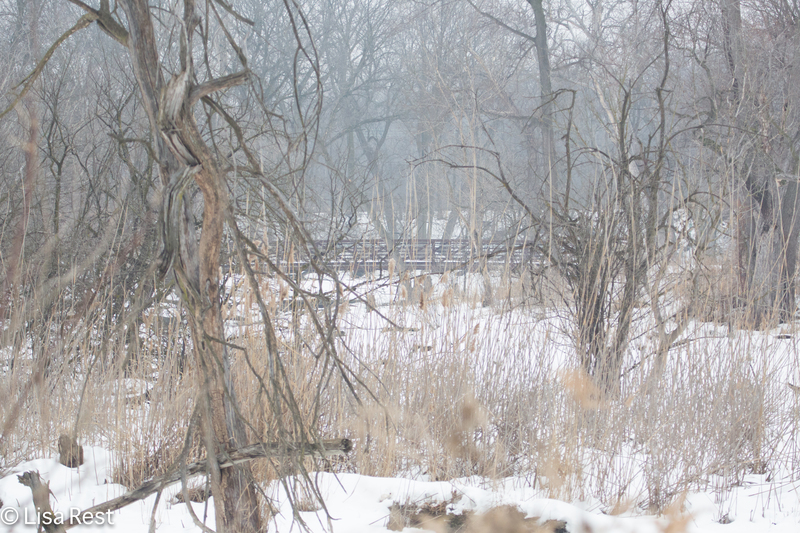 There were no clear paths, so it was a slower walk than usual at the Portage. 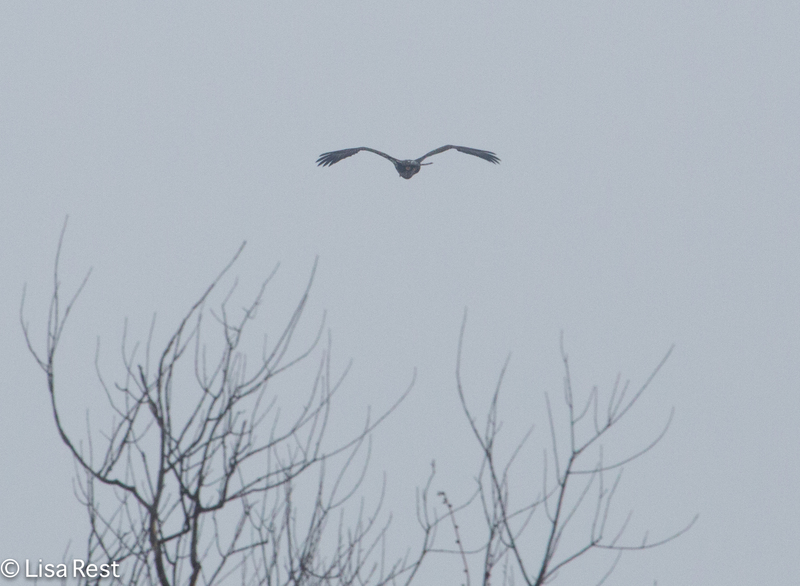 No birds were heard or seen for quite a while, until I spotted a Red-Tailed Hawk perched on a far tree, but the hawk took off before I could try for a picture of it, and then as it flew back around the far side there wasn’t much to photograph. Still the ability to see through the entire preserve in certain spots was amazing to me. I have never been able to see the other bridge until I am almost on top of it. This must be due to the clearing of so many trees. 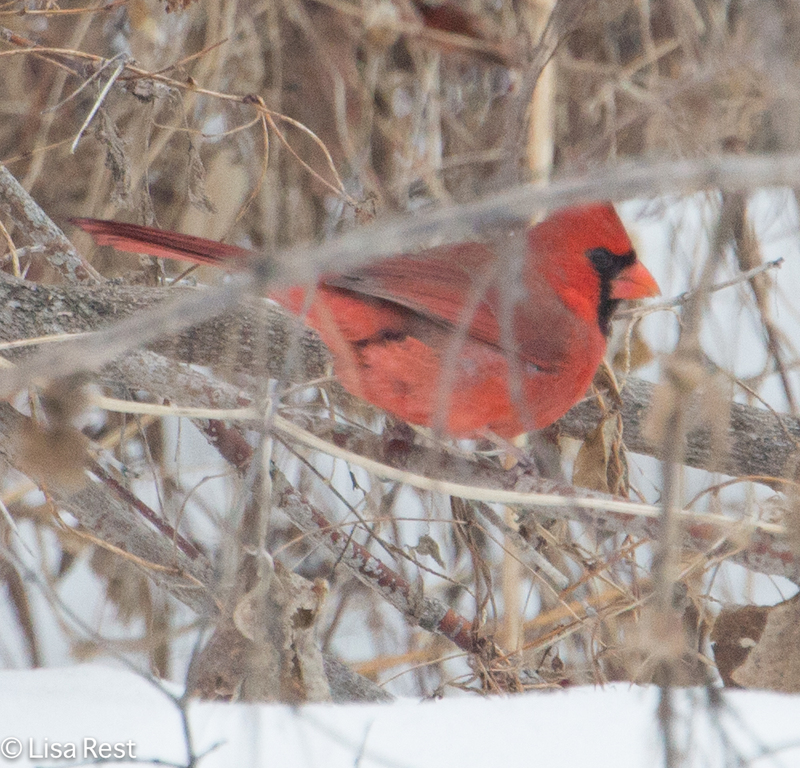 I did finally run into a concentration of birds – mostly Northern Cardinals, in fact more than I have ever seen together in quite some time (a group of Cardinals being a college, conclave, deck, or Vatican, depending on what term you use), and there was a White-Throated Sparrow or two and some Black-Capped Chickadees – near the halfway mark. 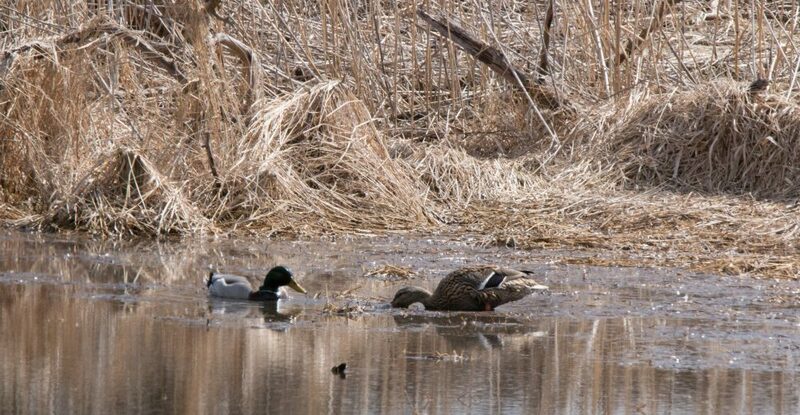 I stood and watched them for a long time, but they were quite far away and I knew I wasn’t going to be gaining on them. The lack of light today was my most operative challenge. 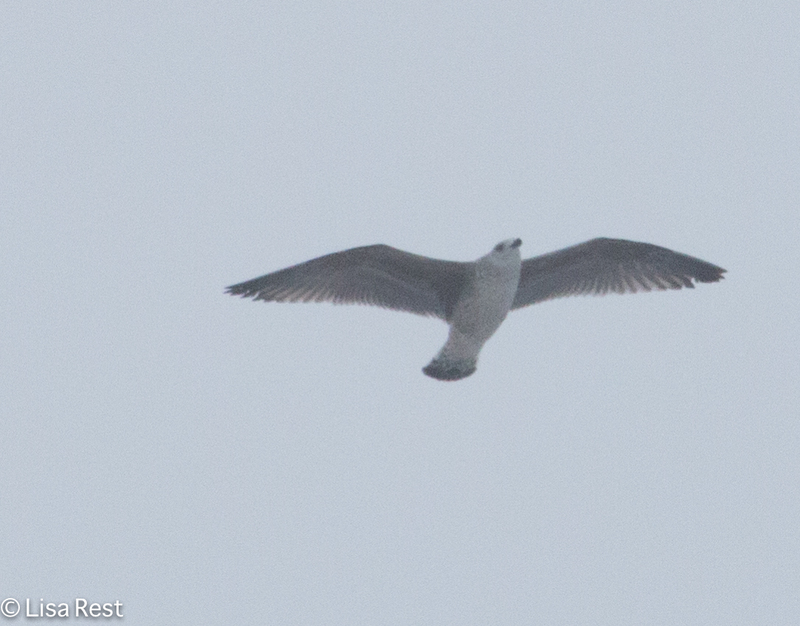 A Ring-Billed Gull flew over. 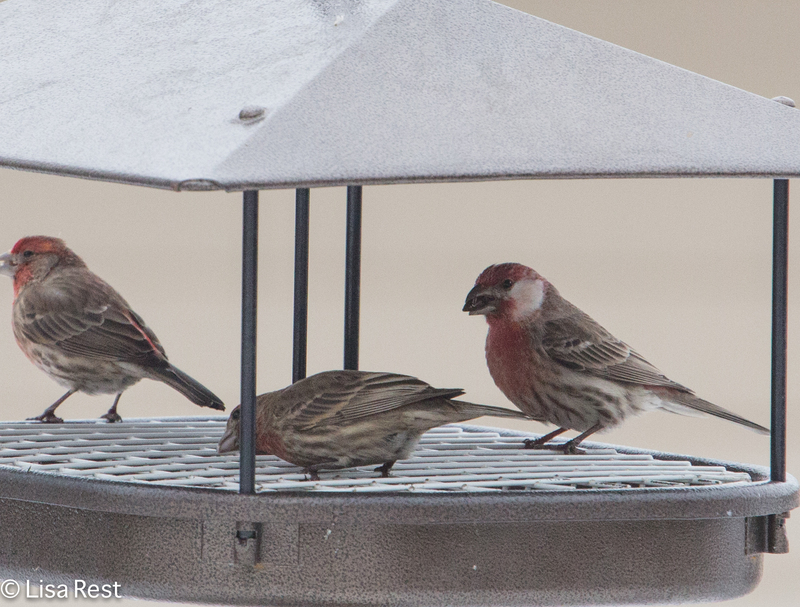 Things were decidedly more active at the sunflower seed feeder when I got home, where I inadvertently got a picture of a rather odd-looking House Finch. 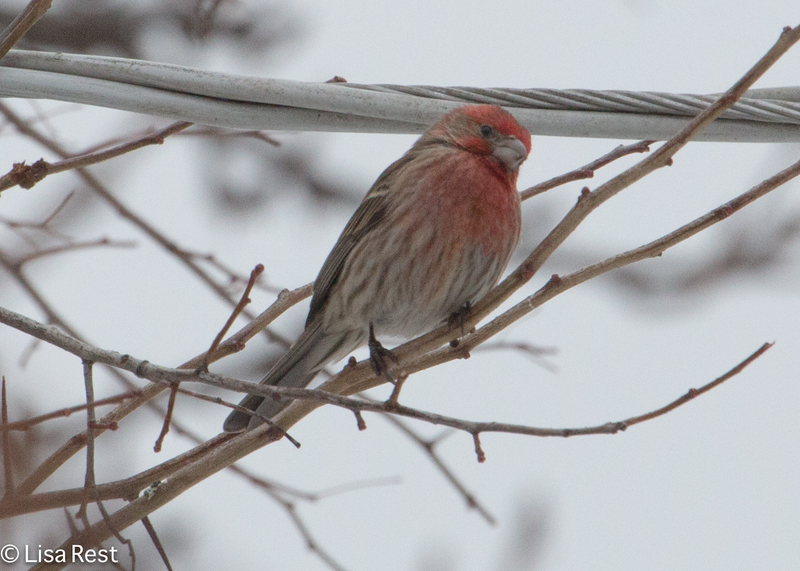 A more traditionally colored House Finch was in the crabapple tree. 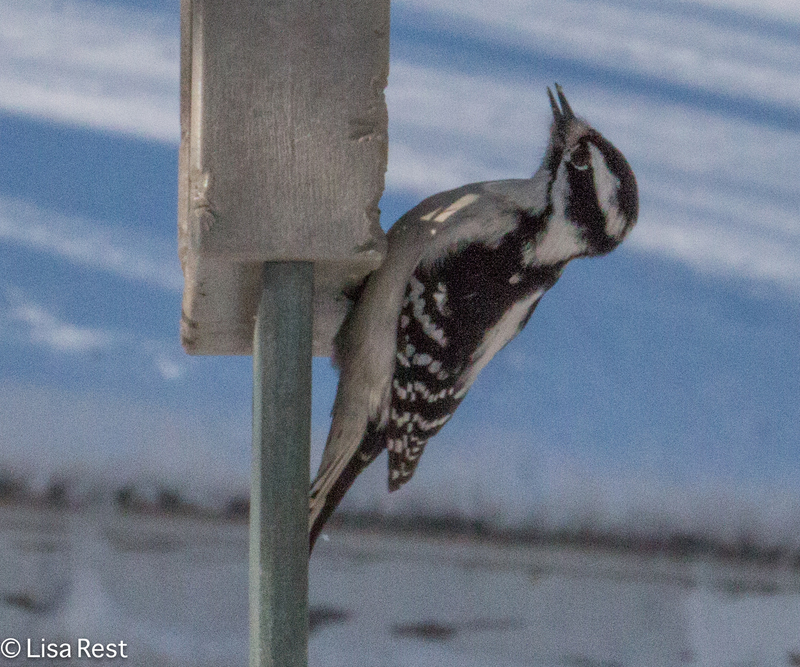 The Downy Woodpecker photographs are from last weekend when I was snowbound and they came into the yard individually, at different times of the day, notably when the other birds were absent. 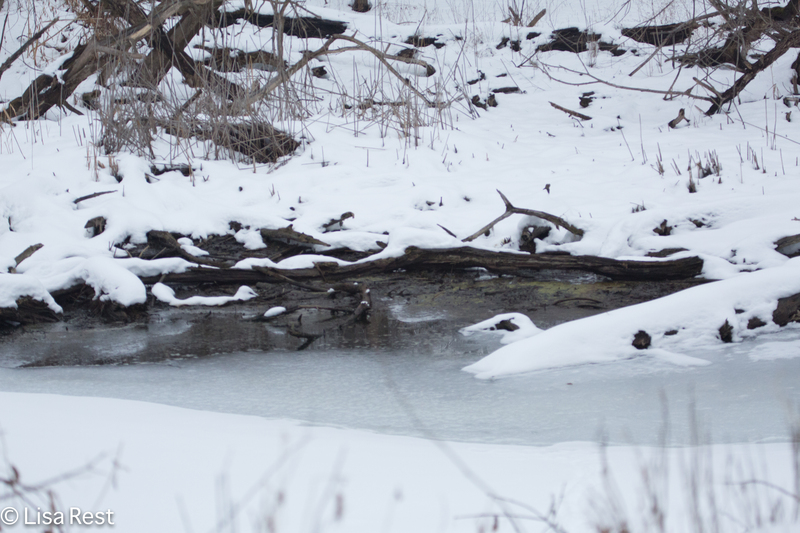 Spring is ever-so-slightly hinting at its promise with the days getting longer and a bird here and there trying out a bit of song. 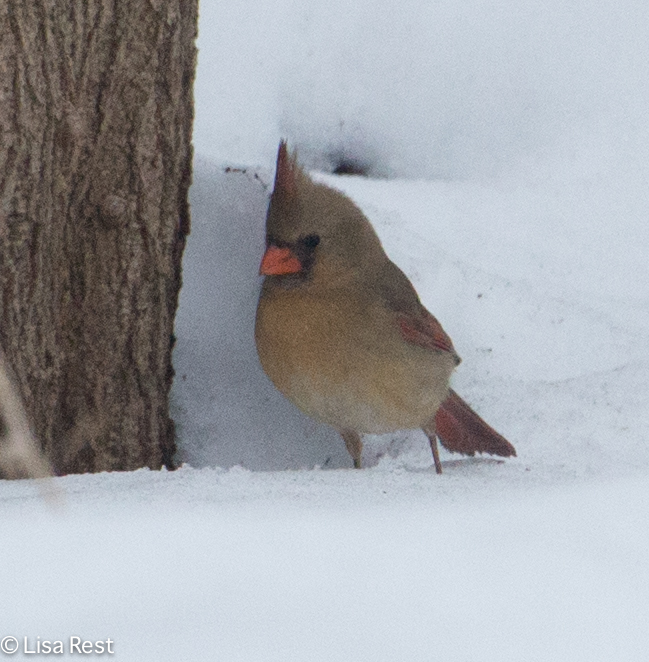 I have heard Chickadees, an occasional Robin and sometimes a Cardinal. Maybe the best “sign” for me was six American Crows flying into the trees on my street yesterday when I left for the dentist. A return of crows to my neighborhood would be the first after 13 years. 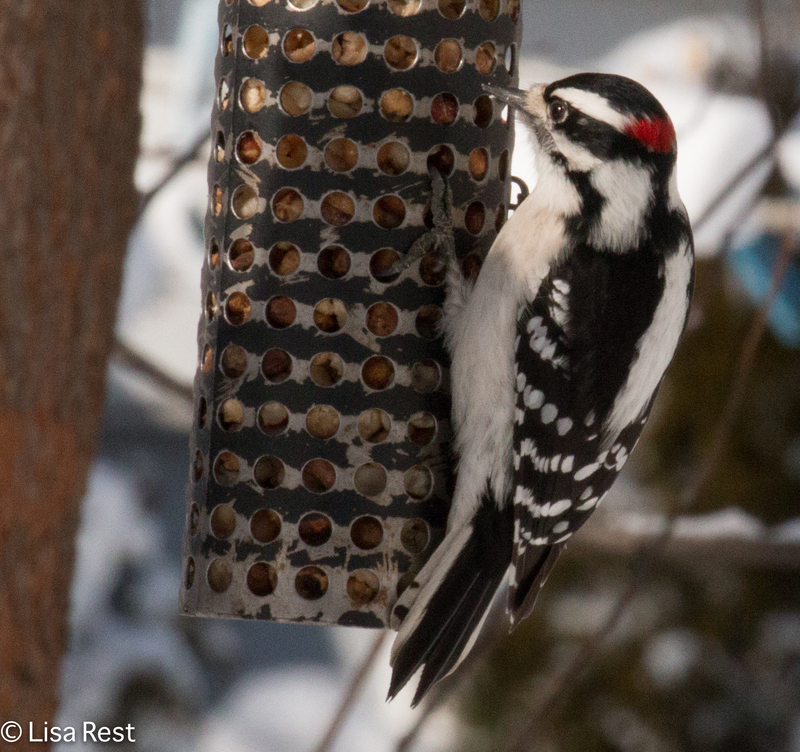 This entry was posted in bird song, birds, Chickadees, House Finch, photography, raptors and tagged Black-Capped Chickadee, Chicago Portage, Downy Woodpecker, Northern Cardinal, Red-Tailed Hawk, Ring-Billed Gull, White-Throated Sparrow by Lisa Rest. Bookmark the permalink. 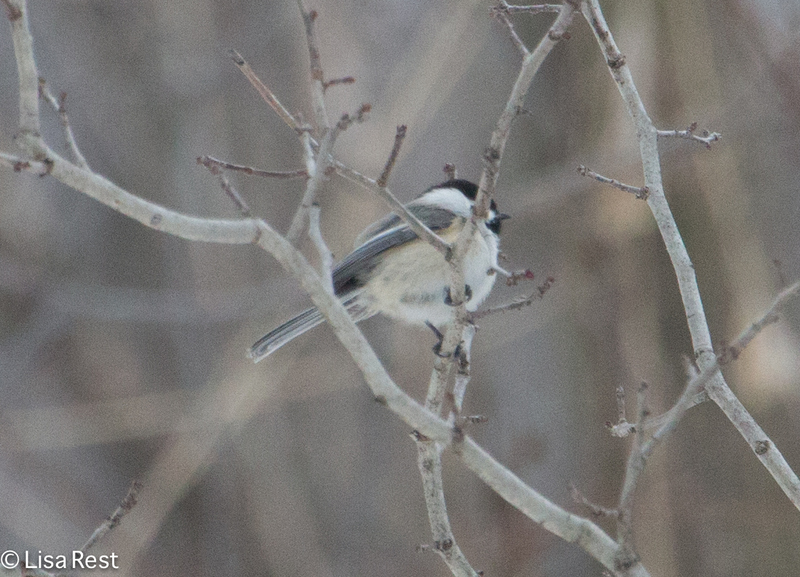 Hi, glad you are not having auto-focus problems with your tele-converter on your 5D with the 100-400mm lens. My problem is probably me, not using the lens correctly with it attached. I just haven’t used it that much. I hope that your light improves and you can get some practice in with the long lens. I loved the woodpecker. Thank you. 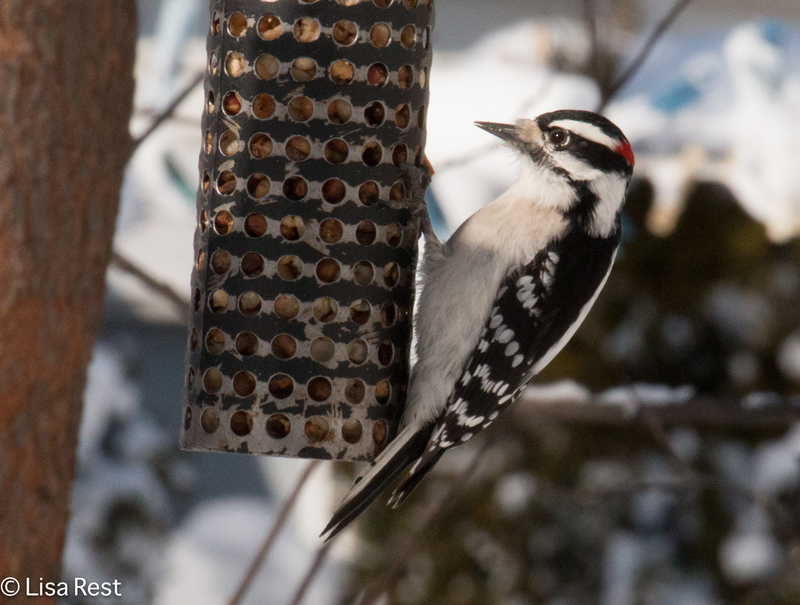 I think the woodpeckers are the easiest to photograph in the yard because they tend to visit when the other birds aren’t there and my presence probably gives them even more feeding time. A beautiful series of captures, Lisa!